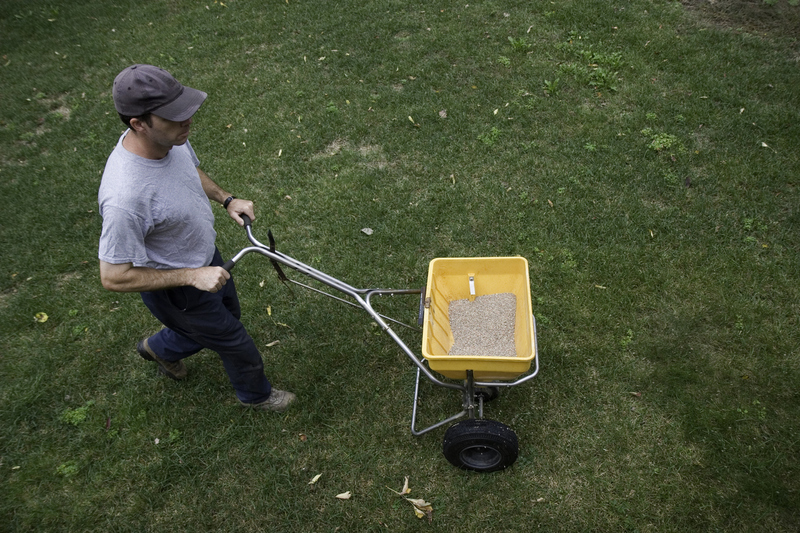 Many clients consider spring fertilization with a ‘more is better’ mentality. However, the best way to apply spring fertilizer needs to be thought out properly to ensure a great and healthy landscape all season long. Make sure you follow these gardening guidelines for a healthy landscape this season! Always make sure you are fertilizing your garden after we are free and clear of freezing temperatures. It is recommended to start thinking about fertilizer applications in mid/late April to avoid possible freezing temperatures on new growth. Here the ‘more is better’ mentality can do more harm than good. It is always advised to follow the instructions on your garden fertilizers very carefully. If you apply too little you can receive poor results and waste your investment in the fertilizer application. Conversely if you apply too much you run the risk of burning the fine root hairs on the ends of the root ball and can cause serious damage to the plant. Please always follow the instructions on the label; or give DiSabatino Landscaping a call so we may tailor fit a proper treatment plan for your home. We here at DiSabatino recommend the following treatment/fertilizer plan to ensure the best overall health of your home’s landscape. Early Spring – Deep Root fertilizers to get the nutrients directly to the root ball. Late Spring – Time release formula to get your landscape through the summer months. Early Summer – Plant inspection is KEY. Check your plants for insects, fungus, or damaged limbs at this time so they can be treated accordingly. Mid/Late Summer – One final application of the time release formula and one additional insect or disease inspection. Winterization – Treat ALL evergreens with an anti-desiccant and give all ornamental trees and shrubs; under 15’; approx. 10 gallons of water to reduce the risk of high water loss during harsh winters. 4) DO NOT Fertilize if the Plant is Thirsty! It is very important to make sure the soil moist prior to any fertilization. Similar to over fertilizing; if the soil is very dry the root hairs on the main root ball are very weak and will burn when fertilizer is applied when the soil and root ball are dry. If the soil is too hard to get a small shovel into it easily please do quick thorough drench of the plants you intend to fertilize then come back the following day to apply the fertilizer. We here at DiSabatino Landscaping highly recommended AGAINST fertilizing with any combination treatments that contain both a fertilizer and a weed preventative. These combo products are very expensive and cause more harm than help in your landscape. If you wish to combat the weeds while ensuring your gardens growth; always use products that are specifically attuned to your particular needs. A time release formula like Preen or Barricade is great to combat weeds during the growing season and can be applied easily. Whereas Miracle Grow or Shultz’s; landscape specific; fertilizers should only be used to enhance your landscape plantings. For information about garden maintenance and fertilization services, contact DiSabatino Landscaping today. Posted in Delaware Landscaper, Fertilization, Fertilization Tips, fertilizer and tagged Early Spring Fertilizer Application, Five Tips To Help Your Garden Grow, Five-Step Fertilizer Treatment Plan on April 3, 2019 by Denise Bernstein.